One thing that really surprised me coming out of the recent reader survey that I ran was that every single person who responded to the question “what topics would you like me to write about?” said some variation on food/recipes/cooking. I’m a decent cook but not a great one (although perhaps I should shift my mindset on that and start thinking I am a great chef? Who knows what I might be able to achieve…); I tend to follow and riff on recipes rather than creating my own. The success I do have is largely due to my long years of experience – I’ve been cooking dinner every night for over 15 years now and in general I can read a recipe and get some idea of whether I’ll like it. But one thing I have been having a ton of fun with recently that y’all might be interested in hearing about is cooking with Carys. Carys is currently obsessed with cooking. Several times a day she points in the general direction of the kitchen and says “See! See!” with a great sense of urgency. This is our cue that she wants to begin a kitchen tour, which means she opens all the cupboards, looks inside and then closes them again, points out all the buttons, knives, and spoons she can see (‘fork’ has been slow to enter her vocabulary, for unexplained reasons), and demands to look in any pot, pan, or bowl that is out of place as well as the sink, microwave, and toaster oven. It’s getting so out of hand that we are currently limiting ourselves to three kitchen tours per day, and I’m telling myself that it’s only a sign of OCD if she has to open and close the cupboards five times in a row, right? Preheat oven to 300 degrees (cooks faster and doesn’t affect the result). 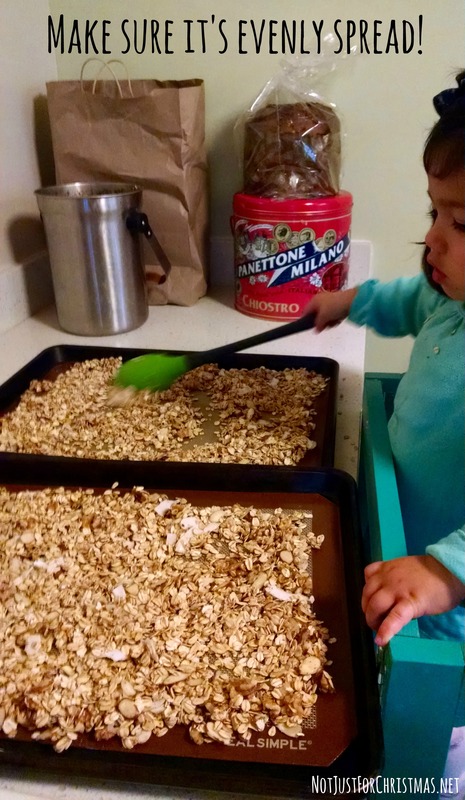 Have your toddler help you measure the dry ingredients into a large bowl. I usually scoop the dry ingredients out of their storage containers and then hand her the cup or spoon to pour them into the bowl. 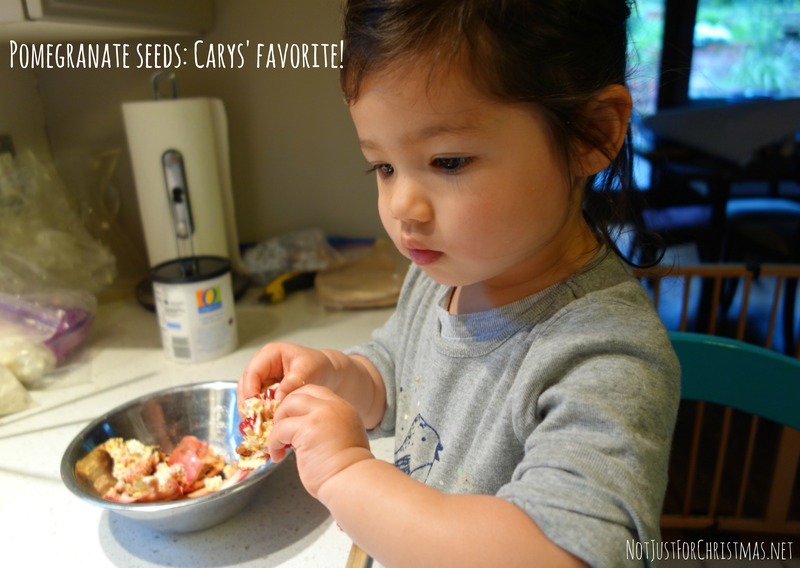 Have your toddler help you measure the seeds, sugar, oil, syrup, and salt into a medium bowl. If you put the seeds, sugar, oil, and syrup into the bowl in that order then you won’t need to wash the measuring cup. Again, I pour the ingredient into the cup and she dumps into the bowl. Combine the wet and dry ingredients in the large bowl and mix very well. Carys usually gives a cursory mix and then I finish up. You want to make sure all of the dry ingredients are coated with the wet ingredients. Divide the granola between two baking sheets by pouring or spooning it. Bake for around 30 mins, stirring and rotating the trays half way through (switch which one is top and bottom in the oven; the one on the bottom will brown faster) – until the coconut chips and almonds are lightly browned and the granola sounds crispy when you stir it. Scrape the granola back into the mixing bowl (best if an adult does this) and let it cool. Add raisins and stir to mix. Store in an airtight container. I made Carys’ foldable helping tower almost a year ago from these instructions, and we love it. I designed the stencil and had it custom made by this guy, who has also done our Christmas cards a couple of times (including the one that was also our pregnancy announcement). The heart in the design signifies the meaning of her first name (‘one who loves and is loved’), while the tree represents a rowan tree. We actually don’t fold the helping tower as much as I thought we would because we’re short of skinny, flat storage areas – most of the time we leave it assembled in the dining room, and lift it over the gate into the kitchen when Carys is going to help us. Our kitchen is too small to have it in there all the time. She climbs up and down easily by herself, and she’s learning about boundaries in the kitchen – she knows (although she likes to frequently test) that she’s not allowed in the kitchen except when she’s invited in, and that bringing in the helping tower constitutes an invitation. I’m so glad she’s enjoying cooking, and that we can enjoy it together.